The Combine starts soon, which means NFL coverage will be obsessed with 40 times, bench press reps, and various other physical metrics leading up to the draft. Like I did last year at wide receiver (with pretty good success), I want to cut through the noise to see if I can figure out which numbers matter when it comes to running backs for Chicago’s offense. This is a variation of the offense Andy Reid runs in Kansas City, so I looked at the Combine stats of all the running backs the Chiefs have acquired since Reid showed up in 2012 to see if there were any trends. This can help us identify what running backs at the Combine – and in free agency – might makes sense for the Bears if they look to re-shape the position this offseason. There were 5 Chiefs RBs identified that were drafted by them, signed to a substantial deal in free agency or earned a meaningful role with the team as an undrafted free agent since Reid took over in 2012. These players were Knile Davis, Kareem Hunt, Spencer Ware, Damien Williams, and Charcandrick West. I used Mock Draftable to look up their Combine data (or found data from their pro day when the Combine was not available) in every category I could find, and compared it to the average RB mark in each of these categories that Mock Draftable has compiled. Full data can be seen here. Many of the measurables didn’t show any clear pattern, but I identified five which did: height, weight, 10 yard split, vertical jump, and broad jump. So there we have a physical profile established for running backs in this offense. 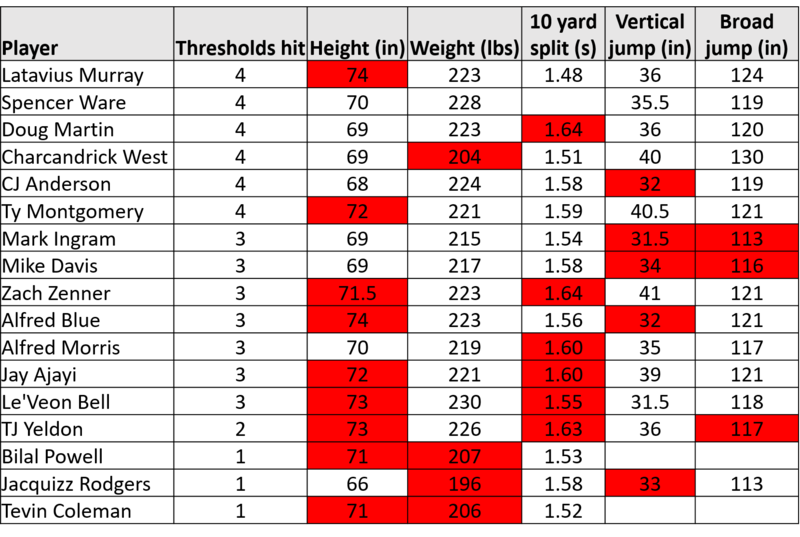 They should be short but well built, have good acceleration (as evidenced by the 10 yard split), and be explosive (as evidenced by the jumps). Interestingly, the agility drills like 3-cone and short shuttle did not seem very important, as 4 of 5 RBs did worse than average in each category. Overall, 1 of the 5 running backs hit all five thresholds, 1 hit 4/4 and didn’t have a measurement for the 5th, and three hit 4/5. So we should watch for running backs who hit at least 4/5 thresholds as potential fits for the Bears. It should be noted that simply hitting these thresholds does not mean a player is a good RB, or that he will excel in Chicago’s offense. There is more that goes into it than just measurables. But it appears that players who excel in this offense typically possess traits that allow them to test well in these areas. I just wanted to make sure to note that testing alone does not tell the whole story (as we’ll see below). Think of this as looking for a physical style of player who should fit the offense. It offers no attempt at scouting out how good the player actually is. Now that we have this data, let’s look at how RBs currently on the Bears roster match that profile. The table below shows Combine (or pro day) results in these three areas for every RB who finished 2018 with the Bears or is currently under contract with them. Missed thresholds are shown in red. Tarik Cohen doesn’t quite fit the mark, but I’m not too fussed about it because he’s more of a hybrid WR than a traditional RB. We already know he’s very good in this offense. Taquan Mizzell doesn’t fit the bill either, in many of the same ways that Cohen doesn’t, and likewise that says more about his role than anything else. Like with Cohen, we already know exactly how he performs is in this offense, which is to say not good. That’s not specific to this offense either; Mizzell simply isn’t an NFL-caliber player. He shouldn’t be on the Bears (or any NFL roster) in 2019. I’m most interested in Jordan Howard here. He just isn’t a fit for this offense, which isn’t surprising to anybody who watched the Bears in 2018. He doesn’t have the acceleration or explosion (not to mention pass-catching skills) to be enough of a threat in this kind of wide-open play style. That’s precisely why the Bears are likely going to replace/upgrade him this offseason. I know many fans liked Ryan Nall last offseason, but he’s basically a less athletic Jordan Howard. Maybe he can stick around as a short-yardage back for obvious running situations, but I highly doubt he’s going to earn a larger role than that. There’s not really any data on Benny Cunningham because he was hurt during the run-up to the draft, but we know he’s more of a special teams player than running back anyway. He won’t see a large role in the offense if the Bears bring him back. Let’s take a look at notable free agent running backs to see who might be a good fit for the Bears if they choose to look there for improved depth. Not all of them are stars, but there are a number of players here who actually fit the physical profile quite well, especially if you remove the height requirement. Le’Veon Bell is going to be out of the Bears’ price range, and Tevin Coleman likely too. But the rest of these players could be realistic options. Guys on the more expensive end would include Mark Ingram and TJ Yeldon, while many of the rest could be part of a platoon with a draft pick for a fairly low price. Players who particularly interest me as inexpensive options include Latavius Murray and Ty Montgomery. Both are good fits in the offense who have proven to be decent NFL players but won’t cost a ton of money to sign if the Bears want to move on from Howard but still have a veteran presence to complement a draft pick.